Noon saakinah is a noon free from any vowel . It remains unchanged in its written form and as well as in pronunciation when continuing to read after it and when stopping on it. 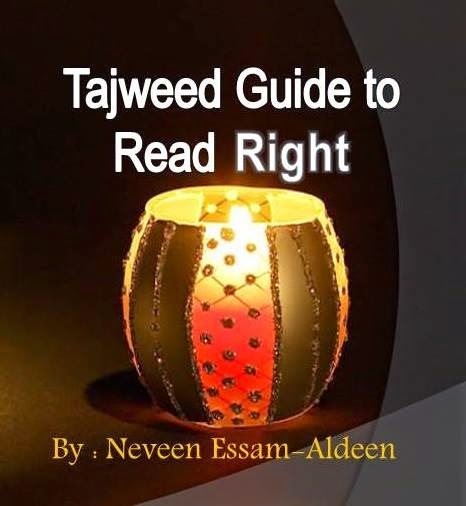 The tanween is a term for an extra noon saakinah not used for emphasis, found at the end of nouns when continuing the reading, but absent from the noun in the written form (the noon of the tanween is pronounced but not written), and abandoned in pronunciation when stopping. The tanween can be accompanying a fathah, a dhammah, or a kasrah, as in: . 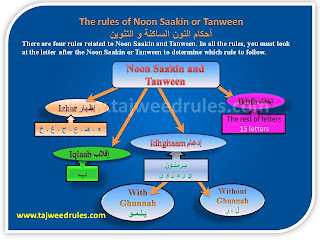 When there is a noon saakinah or tanween, we need to look at the next letter following the noon saakinah or tanween. In this case the is merged into the next letter either partially or completely. Here the is changed into another letter. The Hiding [Ikhfaa]: The is hidden so it is not a clear noon, but at the same time, not merged into the next letter. for Izhar Halqi الأظهار الحلقي lesson click here. for Iqlaab lessonالأقلاب click here. for Idghaam lesson click الأدغام here. for Ikhfaa haqiqi الأخفاء الحقيقي lesson click here.